1979 was the year of the formation for the band NINE BELOW ZERO and this brand new album celebrates the 30th anniversary of the band. DENNIS GREAVES leads the group playing guitar and lead vocals with a mighty rhythm section of GERRY McAVOY and BRENDAN O’NEILL (both of whom spent many years with the late RORY GALLAGHER) and MARK FELTHAM playing his unique style of harmonica. 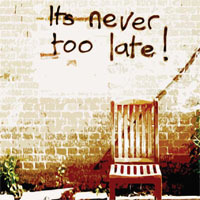 ‘It’s Never too Late’ sounds bright, crisp and is a real testimonial to the band and their ability to record in the studio an album of new refreshing material that captures their energy, passion and mission so ably displayed at their sell out live shows.